Most gardeners in the United States have probably heard about hydroponics in a vague way. Usually related to the use of hydroponics for the production of food. This method has been used extensively throughout Europe, the Middle East and Japan, because of its efficiency of water, space and resulting high yield. The methods used are all automated. The system used for growing tropical ornamentals emerged from Europe about thirty years ago. It consists of a two pot system using expanded fired clay pellets as a medium and a gauge or water level indicator to monitor the liquid nutrient in the outer pot or reservoir. The nutrient is used every time the reservoir is empty. Simply mix the nutrient in advance in a gallon jug and pour through the clay pellets next to the gauge. The clay pellets are sterile, light, porous, insect and fungus free and everlasting. The perfect growing medium for orchids. The clay pellets draw moisture from the reservoir evenly throughout the root zone. Because of the design of the culture pot the roots are not growing in water; they are growing in the fired clay pellets which draw the moisture by capillary action from the supply in the outer pot. They are, therefore, evenly moist but never wet. Because the fired clay does not break down or decompose, the only reason to repot is when the orchid is pot bound. When repoting there is no need to remove the medium. Except for some root pruning that may be necessary, the roots need not be disturbed. With conventional growing materials the minute any medium is put into the pot, it is the best it will ever be. 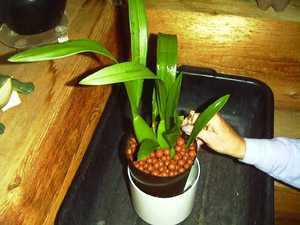 The medium soon begins the process of decomposition and all must be removed from the roots at repotting time.In fired clay pellets the plant is taken from the hyropot, roots pruned if necessary, set in the next size hydropot and additional fired clay pellets added to fill the pot. Since there is no deterioration of the fired clay and the roots are never too wet, the orchid can remain in the same size hydro pot for many years of growth to achieve a specimen size plant. If the orchid is to be divided, this can be done without radically upsetting the roots. Another plus is that insects and fungus do not live in fired clay pellets. Because the orchids are not stress by being too wet or too dry, foliage attacking insects are less prevalent. If a foliage infestation should occur it should be dealt with in the usual way. 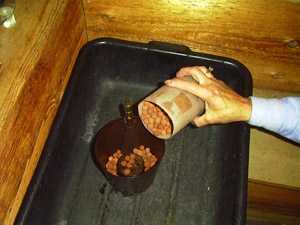 Before reusing the hydro system the fired clay pellets should be air dried and baked in an oven in a roasting pan. 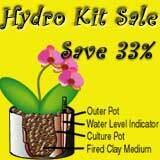 The hydro pots should be washed with soap and a mild bleach or peroxide solution. Leaching should be done once a month by taking the hydroplanter to a warm water source. Separate the two pots and run water through the fired clay. Return the culture pot to the outer pot and refill to half way between "min" and "opt" level with prepared nutrient. Always allow the hydroplanter to go dry before refilling. Light, temperature and air circulation should all remain the same as conventional orchid culture. The hydroculture system will add humidity around the plant which is another bonus. In a dry environment the evaporation rate will increase adding to the humidity around the foliage. For some orchids a rest period after blooming is recommended. In the hydroculture system this is easily controlled. Either replace the nutrient solution with plain water to a initially lower depth, or withhold the reservoir moisture completely and occasionally run plain water through the medium. 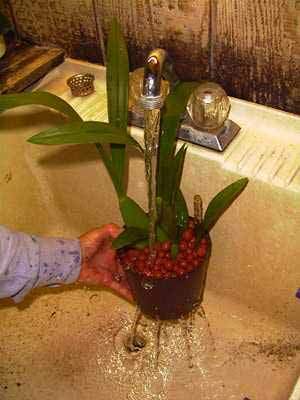 To place an orchid growing in conventional medium into a hydroplanter, simply remove all of the old medium. The roots must be thoroughly washed and pruned; removing any unsound roots. The orchid is now ready to be set into the hydroculture pot. The hydroculture system comes with complete directions and a years supply of nutrient. Call us anytime for cultural advice or to place an order.